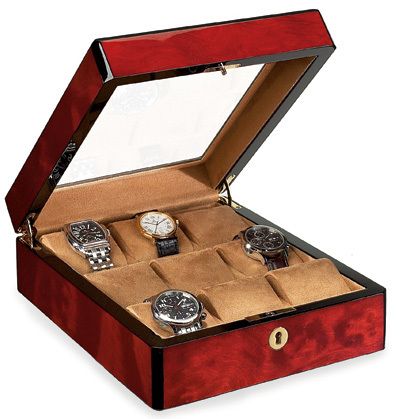 Order your Venlo Tripleburl 9 Slot Watch Case today from FahrneysPens.com. Fine Pens, Refills & Luxurious Gifts – great prices & fast shipping. The Venlo Company is the maker of the finest wood pen cases in the world. The breathtaking Triple Burlwood veneer is engineered exclusively for Venlo combining timbers of maple, oak and ash to create an effect of great depth and dimension. Many layers of thick lacquer and hours of polishing are required to produce the one-of-a-kind, high-gloss finishes. Each case contains 9 watch slots with pillows, and a beveled glass top. Watch pillows measure 60 mm in width to accommodate any watch dial. Features lock and key, brass hardware and non-marking interior.